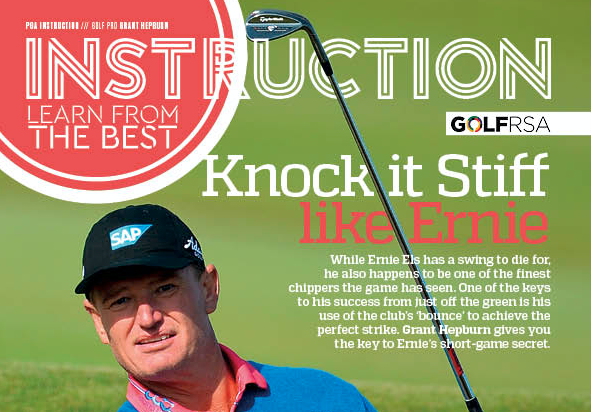 While Ernie Els has a swing to die for, he also happens to be one of the finest chippers the game has seen. 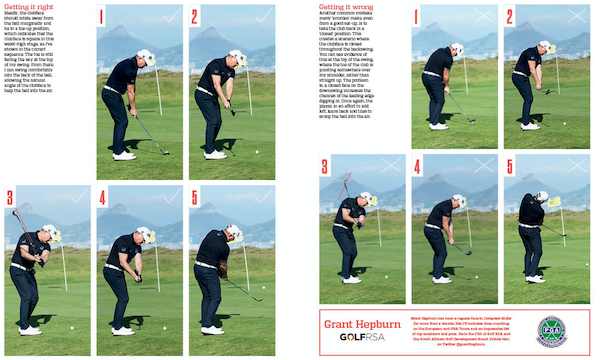 GRANT HEPBURN gives you the key to Ernie’s short-game secret. A big reason for Ernie Els’ success, over his entire career, has been his wonderful short game. 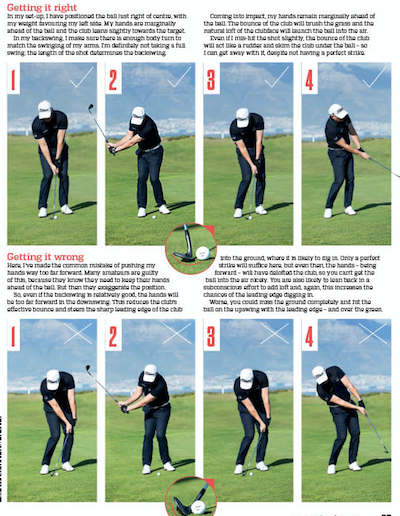 One of the keys to his success from just off the green is his use of the club’s ‘bounce’ to achieve the perfect strike. For such a big man, Els has wonderful touch around the greens and is able to confidently attack the flag with his chip shots. Like all good chippers, Els uses the ‘bounce’ of the wedge beautifully to ensure a crisp strike into the back of the ball. With such a clean strike, he is able to control the amount of spin he puts on the ball, so he rarely hits a real clanger. ‘Bounce’ can be a tricky term to understand. In simple terms, it is the angle between the ground and the sole of the club at address. The bigger the gap, the higher the bounce angle. This angle, which is higher on your scoring clubs, limits how much the leading edge of a club digs into the ground when you make contact with the ball. The angle brings the underside of the club into play, as it ‘bounces’ the club through the surface under the ball at impact. I remember Els once explaining at a clinic why bounce is so relevant, even for amateurs. He said it’s important that golfers strike the ground with the back of the sole and not the leading edge, otherwise the club will dig in and you will lose control. In this tip, I show you exactly what bounce is and how to maximise its use in your chipping. In my set-up, I have positioned the ball just right of centre, with my weight favouring my left side. My hands are marginally ahead of the ball and the club leans slightly towards the target. In my backswing, I make sure there is enough body turn to match the swinging of my arms. I’m definitely not taking a full swing; the length of the shot determines the backswing. Coming into impact, my hands remain marginally ahead of the ball. The bounce of the club will brush the grass and the natural loft of the clubface will launch the ball into the air. Even if I mis-hit the shot slightly, the bounce of the club will act like a rudder and skim the club under the ball – so I can get away with it, despite not having a perfect strike. Here, I’ve made the common mistake of pushing my hands way too far forward. Many amateurs are guilty of this, because they know they need to keep their hands ahead of the ball. But then they exaggerate the position. So, even if the backswing is relatively good, the hands will be too far forward in the downswing. This reduces the club’s effective bounce and steers the sharp leading edge of the club into the ground, where it is likely to dig in. Only a perfect strike will suffice here, but even then, the hands – being forward – will have delofted the club, so you can’t get the ball into the air nicely. You are also likely to lean back in a subconscious effort to add loft and, again, this increases the chances of the leading edge digging in. Worse, you could miss the ground completely and hit the ball on the upswing with the leading edge – and over the green. Ideally, the clubface should rotate away from the ball marginally and be in a toe-up position, which indicates that the clubface is square in this waist-high stage, as I’ve shown in the correct sequence. The toe is still facing the sky at the top of my swing. From there, I can swing comfortably into the back of the ball, allowing the natural angle of the clubface to help the ball into the air. creates a scenario where the clubface is closed throughout the backswing. You can see evidence of this at the top of the swing, where the toe of the club is pointing somewhere over my shoulder, rather than straight up. The problem is, a closed face on the downswing increases the chances of the leading edge digging in. Once again, the player, in an effort to add loft, leans back and tries to scoop the ball into the air.